This gourmet chicken tetrazzini is the cadillac of tetrazzinis, with a rich homemade bechamel and no cream of anything canned soup. This gourmet chicken tetrazzini really is the best tetrazzini I’ve ever eaten, and the secret is in the homemade bechamel. 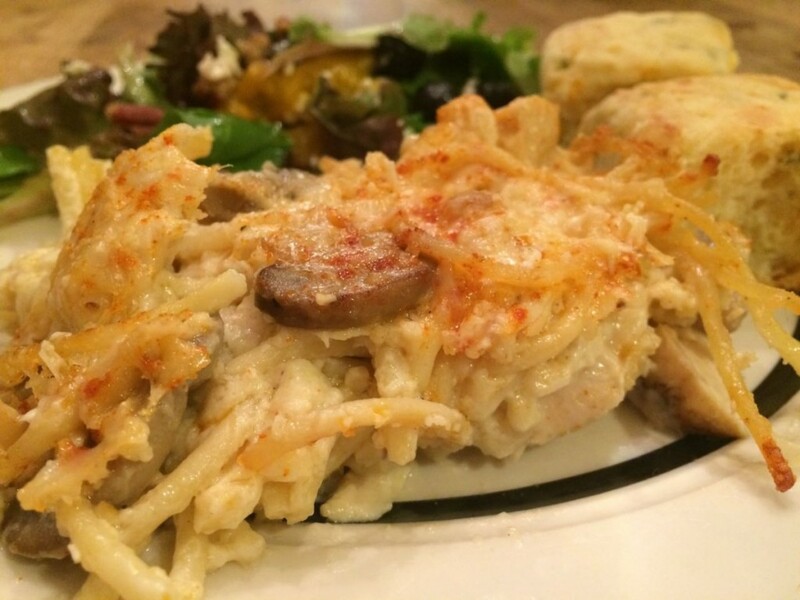 It does take a biy og extra time to make this tetrazzini, but it truly is insanely delicious. My friend Sally, a wonderful cook, shared this recipe years ago in a Briarwood School cookbook. It has become “famous” amongst those of us Briarwood moms who’ve made it or tried it. This is a standard dish taken to new moms or shut-ins, as it truly is a gift of love from the kitchen. Measure all ingredients prior to cooking the sauce (flour, butter and cream). 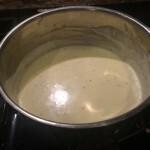 Heat the cream before adding to the roux (to prevent lumps). Utilize a good wire Whisk to remove lumps during cooking. Remove pan from heat as needed during the cooking process to prevent scorching. Make Ahead: This dish can be partially made ahead by cooking, chopping, and seasoning the chicken and storing in a ziploc up to a day in advance. The mushrooms can also be sautéed and stored up to a day ahead. This dish should NOT be frozen since the bechamel contains cream. It may or may not turn out, and isn’t worth the risk. For freezing, I suggest this recipe that I’ve made hundreds of time; it freezes beautifully!!!! Note: For the white wine, I buy small bottles of Cavit Pinot Grigio that contain enough for up to a double batch of this recipe. These small bottles are perfect for those who don’t drink wine but who want to cook with it. I served this to my family this week and they devoured it! When I went to the fridge for leftovers the next day, there were none, as my people had taken all leftovers to school/work for lunch. I served this dish with Callie’s cheddar & chive cheese biscuits from The Fresh Market (a favorite foodie splurge) and a mesclun salad with berries, blue cheese, sugar glazed nuts and homemade honey balsamic vinaigrette. This was a wonderful combination of flavors, textures, and colors~truly a meal you could serve to dinner guests. If you love tetrazzini but absolutely don’t want to make bÃ©chamel, I recommend my other favorite tetrazzini. I’ve made it for years, and it is delicious. It is one of my most pinned recipes from the blog; everyone loves it. If you try this, please let me hear how your family enjoys it. Thank you so much for stopping by. Be blessed, and stay savvy! This dish gives casseroles a good name; it is to die for delicious! Simmer/poach chicken until cooked through. Dice and set aside. (May roast chicken also). Cut spaghetti pasta into 1/3's; cook until al dente. Set aside (stir in a bit of broth to keep it moist). Saute mushrooms in 4 TB butter. Sprinkle with salt & pepper. Set aside. Heat whipping cream (don't boil); set aside. Add flour; stir until bubbly. Add cream, stir with a whisk until smooth. Add broth; stir with a whisk until smooth. Remove from heat; add mayo, sour cream, Parmesan, lemon juice, wine & seasonings. Mix spaghetti, chicken, white sauce & mushrooms together. Sprinkle paprika and Parmesan on top. Bake at 350 degrees for 30-40 minutes until bubbly. Hi Julianne!!! Congrats on your pregnancy and how sweet that you are cooking for your friend too:-) I am not really sure about the ratio of alcohol that cooks off. If you are worried about it, you might substitute chicken broth or apple cider vinegar. I would suggest the broth. It should be fine. Please let me know how it turns out!!! Hi Figgy! OK. I texted my friends who make this often; neither has frozen this one. I have frozen my easy one but not this one. Here is info from The Kitchn about freezing cream: Alfredo sauce is usually just butter, cream, and Parmesan cheese, but this kind of sauce doesn’t hold up well in the freezer. 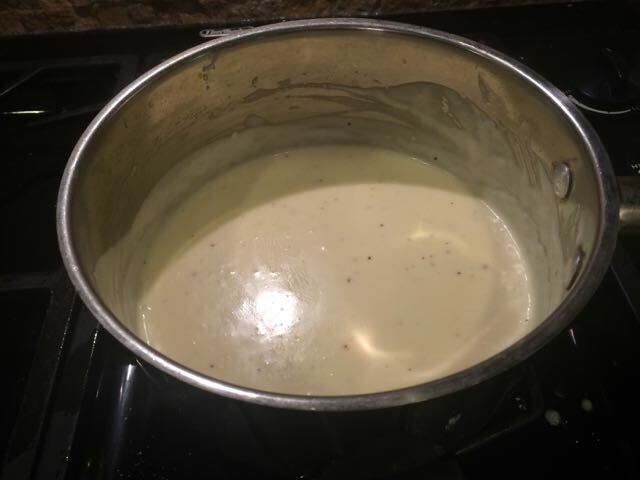 Instead, I took the technique used commonly in making mac and cheese and used a bÃ©chamel sauce of flour, butter, and milk that I finished with Parmesan. This kind of flour-based sauce coats the pasta well and stands up to freezing and reheating. SO…..I would NOT freeze this one. I suggest the other one for making ahead. It is fab also, I promise! Thank u for the info to thaw for 24-48 hours before baking. I just wanted to check with you again. Have you ever frozen it? It has cream so just wondering if you think it will turn out? I would hate to have a flop with 10 dinner guests at the lake! Hi Figgy! If you freeze this, just let it thaw 24-48 hours in the fridge and proceed per instructions. And I let all my casseroles sit for at least 30 minutes so that they “set up” or firm up. Let me know how this turns out. It is wonderful!!! Hi, Just wondering about baking instructions if I make this ahead and freeze? Does it have to rest for an hour after baking like the version using canned chicken soup? I am hoping it would freeze well but I am not sure. Hi Kim! I am SO glad you made and loved this! I totally agree that the bechamel is worth the extra effort and not as hard as many folks think. Thanks for your feedback!!!! Just made this! So excited! Highly recommend making the extra effort making the bechamel sauce! Not hard at all! Thanks Jamie!! It IS wonderful, Judy; we love it too!!!! I have made this ahead and frozen it; it turned out great!!!! Thanks for your feedback! I made this again for out of town family and their comments were so positive. Second and third helpings. Love this recipe. Will be a favorite. Thanks, Judy! But the credit goes to you. Making bechamel is only easy to really great cooks. Bravo to you!! I didn’t have any trouble making the bechamel sauce.. your directions were great. Whisk! Judy, I am SO happy your guests loved it! It is a bit of trouble to make the bechamel, but it is worth it!!!! Thanks so much for sharing!!! I had rave reviews from our guests. One person just called and said, “If I weren’t so full, I could just keep eating it.” Very delicious! Judy, it is DIVINE! Let me know what you think. You will love it!!!! I’m making this for a dinner party. Looks delicious.